Have you heard? “The Nanny Diaries” has a sequel: “Nanny Returns.” And with its release, the popular press is once again awash with analyses of that emotionally fraught quagmire: the nanny-employer relationship. It’s admittedly hard to read these books — or watch the eponymous film based on the first one — and not conclude that all women who hire other women to take care of their children are the moral equivalents of Joan Crawford in “Mommie Dearest.” But like most things, there are two sides to this story. While it may not be easy to find a good family to work for, hitting upon the right person to care for your kid is no day at the beach either. 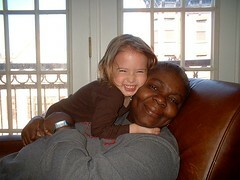 Image: Park Slope Nanny and Child by Hunter.Gatherer via Flickr under a Creative Commons License. We are about to move and trying to get our wonderful nanny well-settled with a new family before we leave. I knew we were lucky to have found her, but I never realized quite HOW lucky we truly were! yes! there are some real gems out there (we’ve had several) but also some horror shows…just like everything else in life. thanks for dropping by! Oh dear. . .& then some. Fortunately, you & the kids ended up with 2 excellent young women, so some stories do have a happy ending. Personally I thought the Nanny Diaries was the self-indulgent tale of a young woman with a real masochistic bent, so I am more than happy to hear about the parental side of the story – esp as I have lived it myself, with pretty good results so far.